There is not much left of the irascible Albert Evan Jasper, “dean of American forensic anthropologists,” after his demise in a fiery car crash. But in accord with his wishes, his remains—a few charred bits of bone—are installed in an Oregon museum to create a fascinating if macabre exhibit. All agree that it is a fitting end for a great forensic scientist—until what is left of him disappears in the midst of the biannual meeting (a.k.a., the “bone bash and weenie roast”) of the august WAFA—the Western Association of Forensic Anthropologists—in nearby Bend, Oregon. Like his fellow attendees, Gideon Oliver—the Skeleton Detective—is baffled. Only the WAFA attendees could possibly have made off with the remains, but who in the world would steal something like that? And why? All had an opportunity, but who had a motive? Soon enough, the discovery of another body in a nearby shallow grave will bring to the fore a deeper, more urgent mystery, and when one of the current attendees is found dead in his cabin, all hell breaks loose. Gideon Oliver is now faced with the most difficult challenge of his career—unmasking a dangerous, brilliant killer who knows every bit as much about forensic science as he does. Or almost. 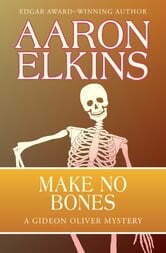 Make No Bones is the 7th book in the Gideon Oliver Mysteries, but you may enjoy reading the series in any order.